The Path You Take: Die Gestalt. The key difference between alignment theory and other exercise/stretching practises (yoga, pilates, etc.) is that alignment not only focuses on where your body is in space, but also evaluates the position of your parts relative to your other parts. Like when we evaluate someone's spine, we also look at the ribs and pelvis and legs. Or when we look at someone's feet, we also have to look at their knees and pelvis and torso...and also shoulders...and the head. The body is really one unit that depends on all its parts to work together properly. You'll never get to the root cause of problems if you don't look at all parts of the body. Cervical disk degeneration can originate in the foot and calf, and if you aren't looking at the body as a whole, you're going to miss the root cause of the problem. Take this shoulder stretch. In the first picture, sure, my arm is on the door frame and my body is going past the door frame. But in actuality, I'm NOT stretching my shoulder. I'm just collapsing through the back to make it look like I'm stretching my shoulder. There isn't much regard for the position of the upper arm relative to the actual shoulder joint, and the fact that half my back is displaced is a big clue that this stretch isn't doing what it's supposed to. 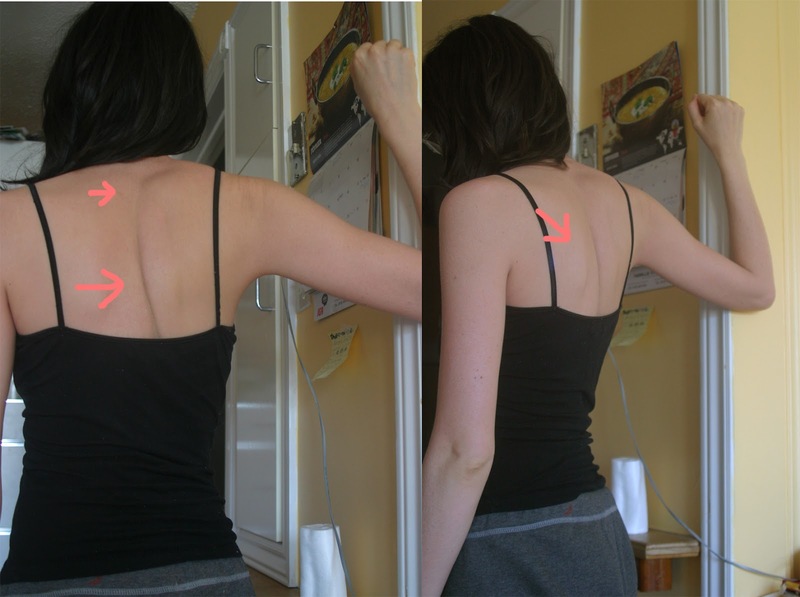 In this second picture, you can see that my shoulder blade is stabilized, and I'm not allowing my body to hinge in the center to allow my arm to come back further than it actually can. Here I am actually opening the shoulder joint and getting a good stretch. 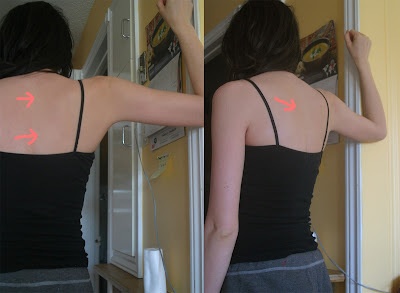 It might not seem like a big difference, but if someone is supposed to be doing physio for their shoulder (to heal an injury or something) and they're doing the stretch by collapsing their back instead of just moving the arm, they're not going to get the results they could get if they did the stretch properly. It's the difference between a full recovery and a life long "bad shoulder". This applies to every stretch you do. The position of other parts, besides the part you're stretching, can make a difference to what you're actually doing, vs. what you look like you're doing. Ok, ok, so what. It looks like I'm stretching, but really I'm not. Call an ambulance, right? Well, this concept can actually be applied to a much more dangerous situation. An example of this is when people are told they are swaybacked when really they are thrusting their ribs into the air to make it look like they are swaybacked. That's because the diagnosis is often made looking only at the the spine, ignoring the position of the ribs relative to the spine, and the pelvis relative to the spine, and the position of the femurs relative to the pelvis. Even the way you carry your weight (either on the front of your foot vs. the heel) can add to the illusion and make things appear like something they're not. It's really important to understand the difference between the way things look or seem and the way things are. It's like katy says about fixing a flower pot on a crooked table. The flowers on the crooked stand LOOK crooked, but really it's the table that's the problem. Until you fix the crooked table, nothing you do with the flowers is going to help. So if you have a bad back, it's time you started looking at other parts of your body to fix the problem. You're not Astar the robot with all these separate functioning parts. You are one unit, and what you do with one part affects all the others. I have not for many years practiced classical yoga, because no matter how strong I am (and I am very strong and flexible, etc. ), classical yoga postures HURT ME. And here you mention yoga and pilates in opposition to alignment. Intuitively, I have come to think that there is a lot WRONG anatomically with yoga poses, but I would love to hear something from someone like yourself about this. This is such an awesome comment I'm actually going to answer it with a blog post. :) It won't take long!! Alright Christine, I have done my best to answer you question :) Thanks for giving me such a great topic to write about! !